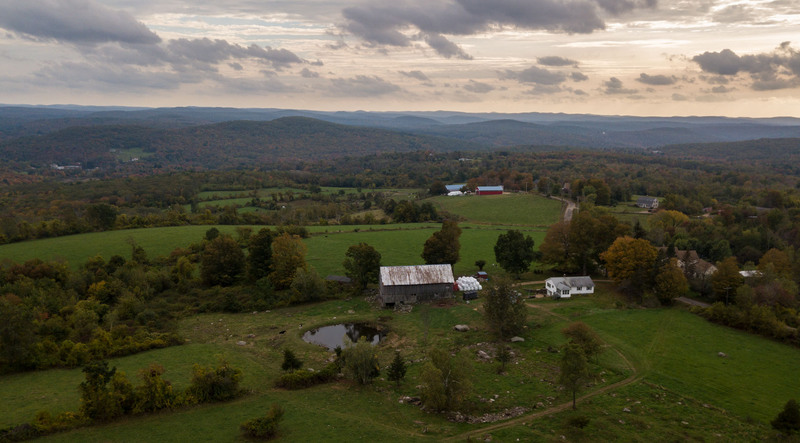 Rocky Acres Farm is nestled atop Coy Hill in Warren, Massachusetts, home to not only cows, but also an abundance of rocks; hence the farm’s namesake. As you are driving up Coy Hill Road, on your way to visit our farm, you will notice that the view will open up to gorgeous scenery, allowing you to see land for miles around, and take in the beauty of our farm. The farm will be on the right, 690 Coy Hill Road, to be exact. One of our favorite sights to see, is in the summer, when the calves, heifers, and milking cows are all grazing on green grass in their respective pastures. The farm has been in existence for hundreds of years- in fact the farmhouse is the oldest house in Warren! 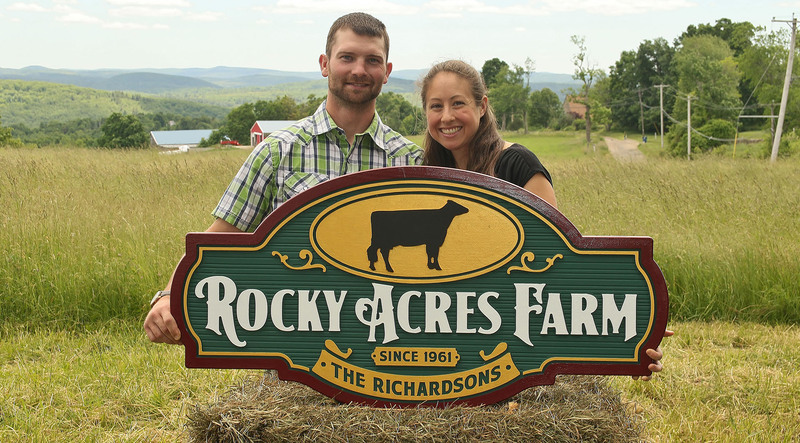 Rocky Acres has been owned by the Richardson Family since 1961, when Leroy and Doris Richardson purchased the parcel of land where the main farm is located. Their only child, Robert “Bob” Richardson, fondly remembers that January 1st morning when his parents first assumed ownership of the farm. He was 9 years old at the time, and he remembers sleeping in the empty house with his father, to get up early and start chores that morning. 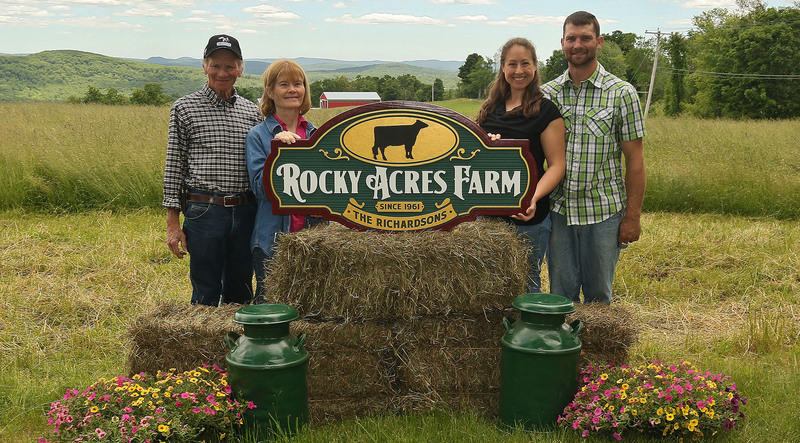 Ever since then, Rocky Acres Farm has been a source of pride for Bob- he knows that farm like the back of his hand and even the surrounding land- all you have to do is point to a spot in the distance and he can tell you where it is! As years went by, Bob married Marty, his high school sweetheart, purchased the farm from Bob’s parents and they built a life together on the farm, raising their two children, Bonnie and Brian. Over time, Bob and Marty purchased different parcels of land that abutted the original farm, adding valuable acreage that allowed them to have more land for their cows to graze. They decided to take a different approach to the “normal” management strategy on most dairy farms and converted the herd to a seasonal calving and grass based dairy system. The land and farm are much better suited to this approach and the cows have done well on this system. In 2003, when it became legal to sell raw milk, Bob and Marty decided to get a license to sell raw milk off the farm, as people had approached them wanting to purchase the product and they knew it would add to the sustainability of the dairy. As their son, Brian, got older, he has become more and more involved in the daily operations of the farm. As a boy, he had chores to do and calves to train for the local show circuit. With every year that passed, Brian took on more responsibilities and learned new practices and skills that ultimately have added a lot of value to the farm; he learned artificial insemination, allowing them to breed their own cows, he learned concrete and construction and he has put those skills to good use, fixing up the barns, helping to build the new heifer barn in 2011, pouring a concrete barnyard for the cows, and putting metal roofing on the barns to help preserve them for the future, amongst many other things. In 2012, when Brian was dating, his now wife, Heather (Gregoire) Richardson, Heather moved back to Massachusetts with a trailer load of her own cows, and settled on the farm. (After graduating from Virginia Tech in 2007 with a B.S. degree in Dairy Science, Heather moved to Delaware, where she managed a 500 cow dairy farm for 5 years and started the DE Junior Holstein Association.) Upon Heather’s arrival, Brian and Heather began to assume the daily milking and management of the herd of cows, allowing more time for Bob to do field and pasture management. Brian and Heather are steadily trying to improve the overall genetics and management practices on the farm, and they have been able to achieve exemplary milk quality for the past few years. In fact, in 2015, the farm was awarded a very prestigious milk quality award. Out of over 1200 farms in the Agri-Mark Milk Cooperative, Rocky Acres Farm was presented with the award for Top Overall Milk Quality (1st Place!! )- something they are very, very proud to have won. 2015 was also a very exciting year for Brian and Heather, as they got married in August, in one of the fields, overlooking the grazing cows and their farm! Since then, Heather and Brian have achieved 1st place Overall Top Milk Quality Award for Agri-Mark again in 2016 & 2017, as well as a GOLD Award recognition in the National Mastitis Council’s Dairy Milk Quality Award in 2016 & 2017.